Shabby to Sleek in Minutes. Experience up to 95% Less Shedding in Just One Use. Patented Design. Wave Pattern Blade Gently Brushes Away Loose Fur, Dirt and Dander without Snagging. Will Not Cut or Damage the Hair. Works on All Coat Types, Except for Pets with Long, Human-Like Hair. Also Removes Pet Hair from Furniture, Vehicles, Carpeting, Blankets, Pet Bedding and More. Made in the USA. Lifetime Replacement Warranty. Guaranteed to Work or Your Money Back. Want to see it work? This YouTuber tests out several products but here is her using the SleekEZ. I love the fact that you don’t have to “empty” it as you do with so many other tools. The hands-down runner up in this post was Betty’s Best StripHair Gentle Groomer. This is a great non-metal alternative to the shedding blade winner above. It shares similar product features to that of the SlickEZ but in a non-metal tool. The tool has to be worth the cost. How does its purchase price reflect the value it provides. Does it save money in time? Function? Ease of use? Cleanup? Shedding a single horse can take hours over several days. Whichever tool you choose, you want to make sure it is easy to use. Most horse shedding tools are comfortable for use over the large, muscular portion of the horse’s body. We have to take in mind the comfort level when shedding out the sensitive areas of the horse like the face and legs too. If you have a horse with particularly sensitive or “thin” skin you may want to opt for a rubber or plastic shedding tool rather than a metal one. The more horse hair a shedding tool can remove with each stroke the faster we are going to be able to shed out our horse. With each stroke, a horse shedding tool should remove quite a bit of shedding hair. To make shedding faster, that hair should easily detach from the blade so we can take a second stroke. What is the BEST shedding tool you use on your horse that REALLY works? As you can see, the SleekEZ and StripHair are the clear winners. After those tools it’s a mix of standard accessories. There were over 130 comments on this thread in just 2 days! Keep in mind this post wasn’t something I solicited on Facebook. It just naturally happened in a group I am in and I found the results very interesting. Before reading this post I hadn’t even heard of the StripHair! I lumped both standard metal curry combs into this category. There is the spiral one and the sweat scraper or looped blade. I’ve used both and, between the two, much prefer the spiral curry. The disadvantage of this one is that you have to routinely clean it by banging it against the tie rail or your shoe to loosen hair. On the plus side, its easy to find! I think the Furminator works OK at shedding but I’ve experienced blade clogging issues with it. Unlike the metal curry above, you have to actually pull the hairs out. This causes you to lose time shedding. I grew up with these guys! I do hate the sound they make as they scrape the hair off but they work pretty decently for me. I always had one in the tack trunk but never used it enough to go through a whole block. I have to admit this was the first time I’ve heard of a hoof rasp for shedding horses. Kind of a neat idea. Makes me want to try it to see how well it works. It wouldn’t work for the head and legs for sure but over the body? May be worth a try if you have a dull one laying around. I actually did some research on this one. It is pretty much the SleekEZ. Based on this public information, I’d go with the SleekEZ personally. Nothing will ever replace the rubber curry mitt in my grooming bucket. It has so many great uses from shedding to bathing. I lumped any reference to a standard curry mitt or curry brush in this category. The great thing about a curry is you probably already have one in your grooming tote. If you are on a budget, elbow grease and your curry will work wonders for shedding out your horse. I think by the time shedding season gets here and you are reading this post it is probably too late for clippers! If you want to consider clipping (now or for next year) check out this awesome review post we did on the best horse clippers. There are many different variations of this product available on the market and I’ve heard they are great for horses, dogs and cats. That makes it a really versatile item you can use at the barn during shedding season and keep at home the rest of the year. I haven’t tried them though. Have you? The great thing about these little plastic grooming tools by Epona is that they are cute and colorful. Two of the people responding to the Facebook question recommended the shed flower. Hacksaw Blade (2) – WOW, seems dangerous! I wouldn’t recommend this at ALL. Bread Knife (1) – Again, probably not wise to use a knife on your horse’s coat. I would avoid this one as well. Force Dryer (1) – Like the professional dog dryers your groomer might use. 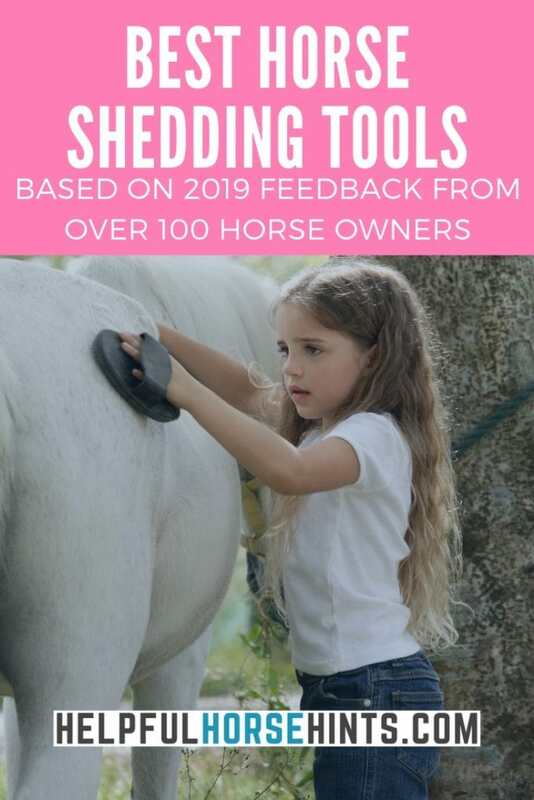 The best horse shedding tool of 2019 is the metal edged SleekEZ shedding tool. The runner up is the non-metal StripHair gentle groomer shedding tool. 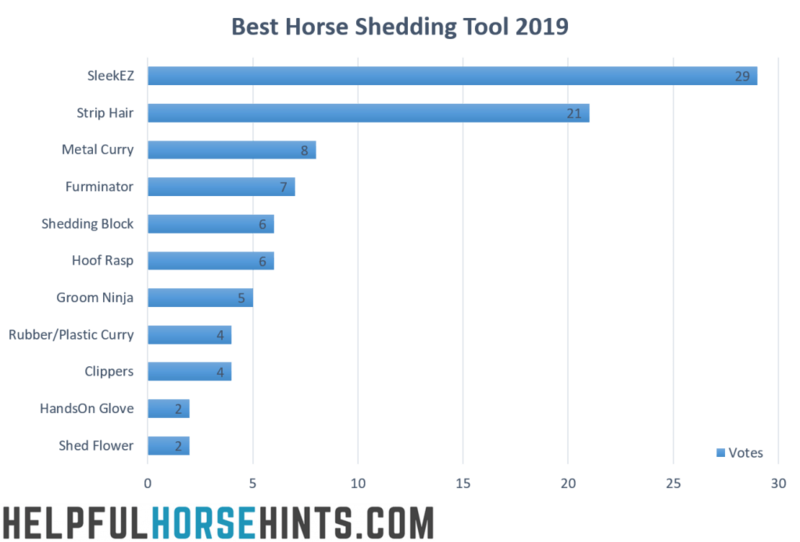 There are many different factors that you need to consider when choosing the best shedding tool for horses. These include price, design, functionality and comfort for your horse. Shedding season can be annoying. Horse hair will be in your mouth, hair, car and and you’ll probably be pulling it out of your dryers lint trap for weeks! Make things easier this year and try out a new shedding tool! Do you have a favorite? What is it? We’d love to hear your thoughts!